Reply to "The bullying tactics have returned"
(Above): The sign board which lay at the southern side of the building after it was torn down. 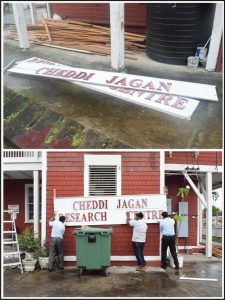 (Below): DEFIANCE: Staff of the Cheddi Jagan Research Centre remounted the sign board of the centre which was torn down yesterday by staff of the Ministry of the Presidency. We have seen that kind of bullyism before. It was even there during the PPP rule when the PNC leadership and supporters went around with their mo fiah slo fiah threats and riots.